Babycakes San Diego is a cake guru, when it comes to baking marvelous and dazzling sumptuous treats for your party. Have it customized your way and experience the best feeling for splurging on the most right cake ideas in California You can find it at a Charming 1889 Craftsman Home, which adds tons of shabby and chic ideas on their products. The cocktail bar lets diners also enjoy the humble edifice together with a warm cup of coffee/latte, sweet dessert plates, comforting ice cold beer or cocktail drinks and wines. Get a free cupcake by Babycakes San Diego, when you email them about your birthday month, right away. Edelweiss Bakery owner’s have a personal touch to their products, using European inspired recipes, which can be dated back 75 years ago. With blending high quality natural ingredients, the store is able to come up with vintage cakes and baked goodies bearing unmatched taste limitations among cake bakeries in California. For holding romantic getaway parties or wedding events, Edelweiss Bakery has something to offer for you. It also welcomes other wedding vendors, if you suggest. 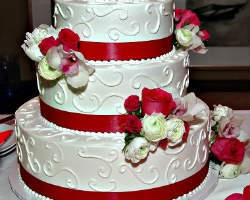 Their popular wedding cake flavors are white sponge and chocolate sponge. On one hand, the top buyer’s choices for their cake frostings are real butter cream and whip cream. Take a sample of its other pastry products in low low prices, today. 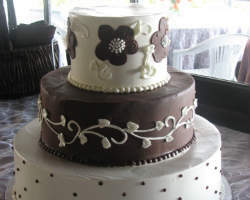 Grove Pastry Shop values their creation of custom cakes in San Diego since 1947. It knows the lovely addition of receiving a cake or sweet gift during a memorable event like weddings, quinceaneras and anniversaries. Their baked goodies range from customized cakes, cupcakes, pastries, breads down to gift baskets. Moreover, bride and grooms can contribute their own inspiring ideas for baking their wedding cake like sharing a photo of a vintage cake they prefer. 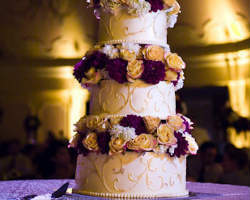 Each wedding cake is made to order, so there are varied flavors and fillings in different cake shapes. Design elements offered at the store are Buttercream basketweave, lace work, sugar flowers, sugarpaste ribbons, bows and swiss dots. Decorative cupcakes on tiered stands or wedding favor cookies are also sold for wedding events instead of cake towers. 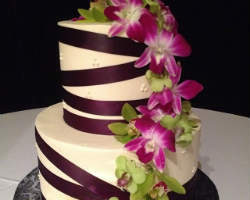 Jennywennycakes specializes in a fine selection of custom cakes in San Diego. They come in natural organic herbs and spices, with oozing flavors inside to out. Jennywennycakes uses recipes produced by Jenny herself from scratch with the best ingredients available. The popular wedding cake vendor uses raised eggs bought from Schaner Farms in Valley Center. Jenny is able to do cake patterns according to a flavor anatomy. She believes she is a flavor whisperer to her customers who are fans of her one-of-a-kind desserts and cake toppers. Presently, it has publicly opened its kitchen in the Mission Gorge for commercialized used. Cake is a top notch bakery store for wedding cakes in San Diego CA with a seasonal café serving delightful slices of their wonderful desserts. Cake is not like every other bakery. Their products are original in recipes and cake designs, which is perfect for other occasions aside from weddings. Baby shower cakes and corporate party give away are hosted together with Cake’s finest products across all points of the city. Guests get yummy slices and will love to eat. Together as a team, its set of talented chefs help customers to build the most sophisticated and sweetest cake in dreams. They come in the flavor choices of orange chocolate, chocolate banana, pear spice cheesecake and champagne.